The US unemployment rate is still a big issue we are trying hard to overcome. The European Union is having trouble with this problem as well reporting a similar statistic for the old and young age group. A logical theory out there is that the more qualified citizens began picking up the positions young people would likely go for. From the European Parliament: Both young and old people are often squeezed out of the labour market and find it difficult to find jobs. 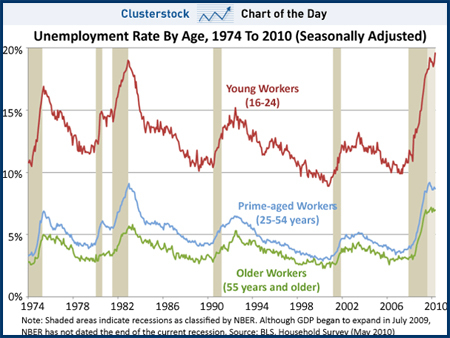 The 15-24 age group has the highest unemployment of any group and just half of 55-64 year olds are in work. Register at your local Workforce Center and be enthusiastic about finding a job. Accept the fact that this is a lengthy recession and that actually finding a job may take a while. Get help creating your resume or updating the one you have. Use any job interview as an opportunity to refresh and fine-tune your interviewing skills. If your computer skills are feeble or non-existent, explore the opportunities for local community education courses that train you in basic or advanced skills. Courses like these are common almost everywhere; they are affordable, if not free, and convenient. File your resume with a temporary staffing agency, highlight your years of experience and your strengths. Get job references in writing from colleagues, managers/supervisors, clients/customers—encourage them to include quantifiable information in their reference letters. Ask a few if they are willing to provide the same in verbal references. These are “testimonials” to your qualifications and experience—what you can bring and offer to an employer/place of business. Seek the support of a local group of unemployed adults—groups like these have cropped up all over the country. Volunteer with an organization you respect and might enjoy learning more about. Check out your job hunting opportunities with job placement services. Get a higher education and better your training. Education and experience is the only way to compete these days now with the previous working crowd now having to step down a bit to lower more entry level positions. Try excelassist.com to pick up freelance roles during your search. It may turn into something more permanent!